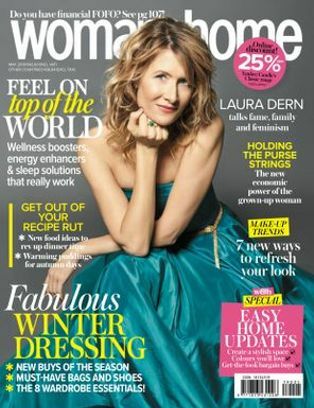 Now that winter’s well and truly behind us, it’s time to show off those gorgeous summer legs – with confidence. Follow these simple steps to get your body prepped and summer legs ready so you can embrace those shift dresses, skirts and bikinis. The Body Shop Cactus Brush, R200, is a gentle, yet effective body brush. Daily body brushing is a great way to improve blood circulation and lymphatic drainage, which has been known to help reduce cellulite and give your legs and thighs that toned appearance. 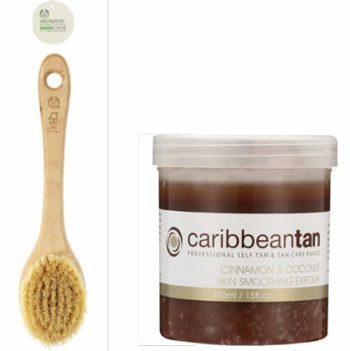 Alternatively, use a classic body scrub to exfoliate dead skin cells like, Caribbeantan Cinnamon & Coconut Skin Smoothing Exfoliator, R59,95. Shave at night with a gentle foaming gel soap like Laline Fluffy Body Soap in Frozen Pear R385, and then use a topical treatment for ingrown hairs. Legole 3-in-1 Ingrown Hair Serum, R86, is ideal because it doesn’t have a nasty odour and conditions the skin, while treating tricky ingrown hairs. 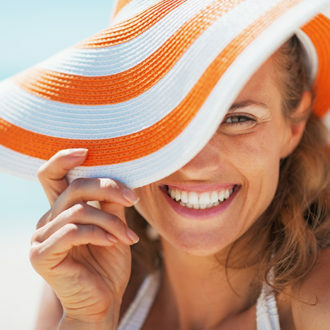 Rather than spending hours in the sun, exposing your skin to harmful UV rays, fake your tan! Start by using a gradual tanner like Decleor Aroma Confort Systeme Corps Gradual Glow Hydrating Body Milk, R469,55, for a subtle tan. We know it’s pricey, but trust us, it’s worth the investment. The formulation literally glides on skin, leaving it soft and nourished, while offering one of the best natural tans we’ve seen. 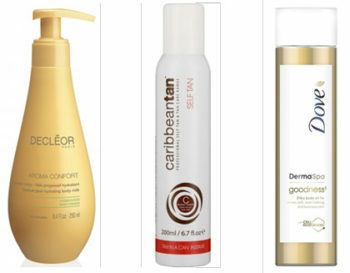 Or get instant results with a fast-acting tanner like Caribbean Tan, Tan In A Can- Instant, R99,95. If neither of these options seem all too appealing, give your skin a natural, illuminating glow by using a shimmer cream or dry oil, like Dove DermaSpa Goodness Body Oil , R133. Let’s face it, at some stage, we’ve all experienced tight, dry skin that’s just plain uncomfortable. It’s most common after swimming in a heavily chlorinated pool, or spending too long in the sun without adequate protection. 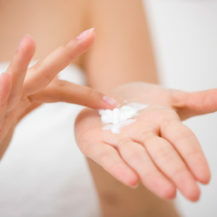 If your skin is feeling dry, irritated or sensitive, it’s best to use gentle, soothing products in the bath or shower. 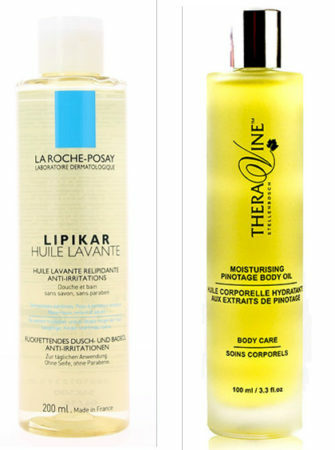 We can’t get enough of La Roche-Posay’s Lipikar Huile Lavante , R230. It’s a gentle, anti-irritant cleansing oil and ideal to use day and night. A good budget buy is Nivea Care Shower Crème, R50. It’s formulated with jojoba oil to gently cleanse the skin without drying it out. Once you’re out the bath or shower, make sure to use a body oil while your legs are still a bit damp. Theravine Moisturising Body Oil, R397, is a dream. The Body Shop Coconut Beautifying Oil, R160, is just as nourishing and half the price. 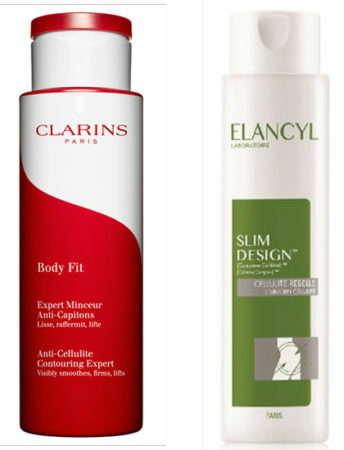 Give your legs a helping hand by using a product that’ll give them a smoother, more toned appearance like Clarins Body Fit Cellulite Control R585, or Elancyl Slim Design, R395. If you’re on a budget but still want to target that cellulite, the classic Nivea Goodbye Cellulite Firming Gel Cream, R115 is a good choice.